While travelling to Seychelles, you will have chance to enjoy some of the world’s most delicious cuisines that is actually a fusion of flavours from African, French, Chinese, Indian and English cooking. For a long time, spices have been combined to create an unique flavour. Grilled fish or octopus basted with a sauce of crushed chillies, ginger and garlic are national favourites as are a variety of delicious curries lovingly prepared with coconut milk and innovative chatinis made from local fruits such as papaya and golden apple. As may be expected, seafood dishes feature predominantly in the local cuisine, appearing alongside the national staple, rice. Palm wine or calou is an alcoholic beverage that is locally made from coconut sap. It is also used in the preparation of many Seychellois dishes. Bacca is another alcoholic beverage that is made from sugarcane liquor and used for ceremonial events. Coco d’Amour is a tropical coconut liqueur that is made with coconut extract. Local beer includes Ekyu and Seybrew. The variety of tropical fruit in Seychelles is huge with varieties of bananas. There are also citrus fruits such as grapefruit, oranges and limes. The Jamalac is a cone shaped fruit that has soft skin and tastes like an apple. 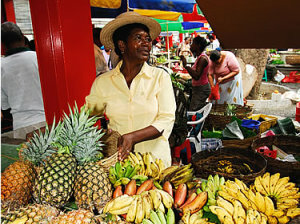 There are plenty of mangoes, pineapples, jackfruit, papaya and custard apples. These are made into fresh salads, juices or chutneys. Seychellois cuisine is unique because it is the mix of the flavours of many different ingredients that were brought to the islands over the centuries. With their own coconut and breadfruit base as well as the abundant fresh seafood, the Seychelles people have created something new. The main flavours are rich, hot and spicy combined in a hundred ways to make each dish flavourful and special. It is worth looking for traditional, local food to experience the true flavours. Hotels often use the word fusion as a blend of French and Seychellois cuisine, but the local restaurants and cafes will give the real thing. 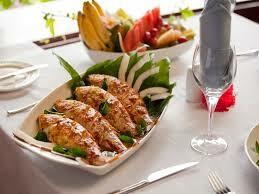 Enjoy your Seychelles cuisine experiences!